Getting my emails to a manageable number is much like getting my weight to a manageable number. Both are great in theory, and neither are made better with a one-pound bag of Skittles. The Skittles help though. They really do. 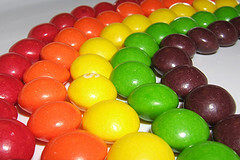 I don’t know why skittles can’t come up with a high-protein;good for you version. How difficult can that be? I have an ever-expanding waistline, but I’m very good about deleting emails that I don’t have to keep. I don’t like Skittles very much, but I can eat M&Ms by the bowlful, which probably explains why I seem to be half in and half out of this number management thing. M&M’s for me, but otherwise I’m with you. I’ve never gone that far … yet! Boy, you’re preaching to the choir here. I have problems with both of those. My email is so full, it’s always just about to start bouncing new emails. My waistline is so full it’s already bouncing all over the place. Some foreigner at a toga party once said, “Nosce te Ipsum,” know thyself. He also said, “Nosce te skittlium,” know thy skittles. I’m thinking of getting “Nosce te skittlium” tattoed on my body. It’s a very inspirational quote and a way to ensure I will always have Skittles with me…even if it’s just on my forearm. And don’t worry if your email is so full it starts bouncing new ones. That’s just a great way to ensure you don’t get any new emails! It’s the perfect set up!